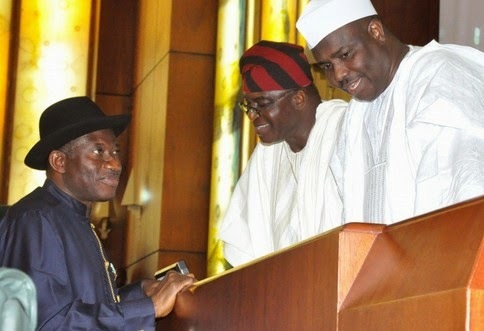 President Goodluck Jonathan has pleaded with Nigerian senators to leave him alone and concentrate on other issues of national Importance. Jonathan declared that the senators should know that there are other issues that ought to catch the lawmakers’ attention instead of threatening to sack him. Jonathan took this position in a statement issued by Doyin Okupe, his aide on public affairs. Funny enough, the statement was silent on whether Jonathan considers that he has, or has not, committed the many and weighty impeachable offence that have been penciled down against him. The Senate in the last four years has conducted its legislative functions and responded to issues that are of great national importance with commendable political sagacity. In this same period, the senate has functioned as a stabilizing force within the polity employing much political maturity that is required to guide and protect our nascent democracy. However, confrontation and strong disagreements are not uncommon phenomenon in Executive-Legislative relationship world-wide. The recent purported attempt by some Senators to prepare impeachable offences against the President, as reported in some section of the Media, is seen by us in this light. We strongly trust and believe in the leadership of the present Senate and the unwavering patriotism and commitment that have been shown by the distinguished members and we trust that ultimately it is this tendency towards true Nationalism that will prevail in the Senate. It is our view that there are at present, serious fundamental issues of National importance such as winning the war against terrorism and stabilizing the economy in the face of dwindling oil revenue which requires the full attention, commitment and swift action of distinguished members of the Senate. We are of the opinion that all matters political can and will be resolved politically in the overall interest of our democracy and the wellbeing of our people.